Two sliced cucumbers and your favorite dip! That's all for this recipe! Ok. They're not really potato chips. They're sliced cucumbers. Once you dip them in this sauce though, the chip won't matter! 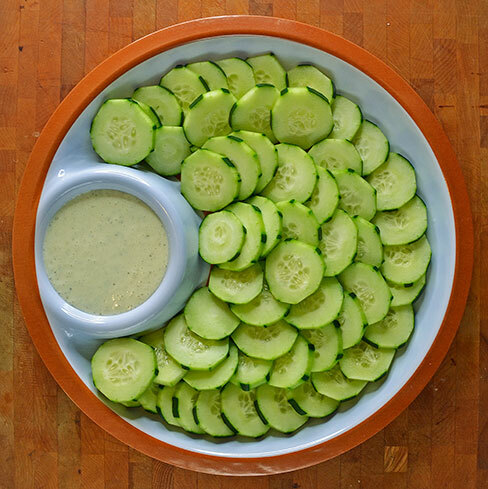 I went to a friend's house for a dinner party a couple days ago and decided to take a tray of sliced cucumber and some Sweet Pickle Ranch sauce to dip them in. It was my low-carb chips and dip contribution to a carb-heavy spread of delicious party food. In truth, I was worried that none of it would get eaten, but the tray went over well and there were just a hand full of cucumber chips left by the end of the night. The best reviews came mostly from the female population at the party, who seemed to like having a healthier option for after-meal grazing as part of the spread. The tray disappeared primarily from people grabbing a slice of cucumber and dredging it in the sauce as they passed by the snack table. The chips and dip, along with a tray of ham pickle roll-ups (like these) that I made seemed to generate lots of good food conversation throughout the night. I couldn't be happier with how the health-concious snack approach was received. I'm really starting to enjoy the unique challenge of healthier food in the quest for delicious bites!